Aaron Beams, owner of Greenway Landscape Services, Inc has been involved with the Landscape & Lawn Maintenance industry for over 15 years. 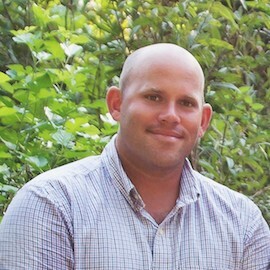 Aaron started working with his family’s business, Polston Construction & Landscaping, Inc until he ventured out to build his own business with Greenway Landscape Services, Inc in July 2012. Aaron and his team from Greenway focus on offering you a variety of outdoor projects, including lawn maintenance, turf treatments, landscape, hardscape, and concrete construction for residential and commercial installs and designs. The Greenway Team will help you determine which plants and foliage make the most sense for your property. We take a close look at your lights, water, drainage and soil conditions to select plants that will flourish in your yard for years to come. We know how to keep your lawn healthy and beautiful all year round and help create a landscape yard that is easy to maintain. Steve Polston, Project Manager with Greenway Landscape Services, Inc (formerly of Polston Construction & Landscaping, Inc) joined Aaron in 2018 to lead in the Landscape construction area for any outdoor projects you desire. Steve has a vast knowledge of how to deal with erosion and drainage issues and is keen to what can be done to correct potential problem areas. Steve has installed numerous retainer walls, patio paver projects, concrete driveways, walkways, fences and decks. Steve’s slogan “if it is outdoors it can be yours” is still his same motto from Polston Construction & Landscaping, Inc. Steve still has that same idea and will work to help create the outdoor living space you desire with Greenway Landscape Services, Inc.